This is where the photos that you want to import are located. LR has seven modules. Library, Develop, Map, Book, Slideshow, Print and Web. I do not plan to go into each of them, only the Library, Develop and Print modules. These options are found at the very top of the software program. The first thing to understand is that in each module you have access to has different menu options at the top menu bar and in the panels. Also, you will not see the same side panels in each module as they change according to the module your in, as do portions of the two side panels: for example, the Library Module will have different options on each side panel than the Develop Module. In Library module you will see your folder structure hierarchy in the left panel, but when you change to Develop module you no longer see that same left panel, but you do see the Collection panel. You can still access your folders, but from a different location, from the gallery strip at the bottom of the page showing the folder that you had marked and are working in or by hitting the "G" and "D" keys to toggle back and forth from Library to Develop. The reasoning behind the collection concept seems to be that you can put any photos that you want to work with in a collection, which can be temporary: you use the collection and then discard it when done after saving your work in another format, such as a slideshow or book or after exporting. Look over the toolbars at the top and move around in the program poking at things before you start working in it so you have some familiarity with the modules and panels. In Library Module, down at the bottom of the left hand panel in LR are two buttons, Import and Export. You can also access the Import command from the menu File>Import Photos and Video or the shortcut keys Shift+Command/Control I. When you click on this button a dark gray screen comes up with lots of options to consider and choose. You can import from the Library/Grid view with the button or from Develop using the Menu or shortcut keys. On the left side panel you will see a list of items to choose from, depending on what files and/or folders you have in your computer. Also, a second way to determine the Source, at the top of the left panel you will see text that says “Select a Source:” Clicking on the arrow key will show you your Source options or you can select the Source by clicking directly on the file you want to import. You can permanently set this arrow button to suit your needs if you so desire or change it each time you import. You can import (link) photos directly from a card or a camera. Or, you can import from files that you have stored on your hard drive: if you choose "add" when importing from your hard drive the photos will remain at their same location. If you have put a photo card into a card reader or into your computer to load onto your hard drive or you are linked up via camera cable to the computer you should see the name of the device on the left panel, you may have to open it and click a time or two to get to the file with your photos: my photo card (I download using either a Flash or SD card) usually says Nikon on it since I shoot with Nikon cameras. Click on your card or camera in the left panel and the screen will fill with your photos. If you are choosing to import photos that are already on your hard drive, you should navigate to that folder stored on your hard drive (within LR using the left panel) and click on it and the screen should automatically fill with those photos (read Organizing Photos for additional information on folder organization). The screen should show a gallery of photos no matter which way you are importing, assuming you are importing several photos at once, and each one will be checked. The checked box means that photo will be imported. If you want to choose each photo to import at this point, you can click "Uncheck All" and then click on each little box, which would be time consuming and cumbersome in my opinion since there are easier and quicker ways to delete photos. I do use the "Uncheck All", however, when downloading and linking photos from my iPhone because I continue to fail to delete photos that were previously imported from my iPhone! In this case I could also check the "Don't Import Suspected Duplicates" box, but I usually want to pick and choose what I am importing from my iPhone. If you have chosen "Uncheck All," you can mark a group of photos by holding down the Shift key, clicking on the first photo, then moving through your photos (while continuing to hold down the "Shift" key) to mark the contiguous group you want, then clicking on the little box at the top at the top left of any of the marked photos you want to include (still holding down Shift), and this will check mark all of the photos. You can make the Thumbnails you are viewing smaller or larger by moving the lever at the bottom right of the photos side to side. This section determines where your photos will be stored. The “To” button at the top right is where most people seem to have trouble. Make sure the “To” text button is set to the place on your hard drive, internal or external, where you want your photos stored. Mine was normally set to Macintosh HD since I stored my files on my computer's hard drive, but this changed a short time ago and it is now set to an external hard drive. 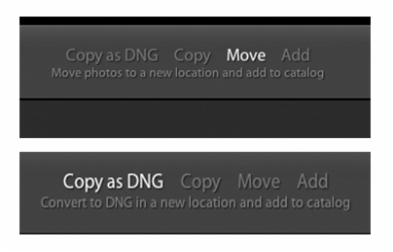 Unless you change the "To" text button, every photo you import using Copy as DNG, Copy or Move (read link) to LR will go into the place you have told the program to put the photos at some point in time. Click on the small arrow just before the "To" button and it gives you the possible choices for your photos based on your computer set up. The only thing that will change each time you import, once you set this top header space, will be the folder you put each set of photos into and this is determined by you upon each import. So, my photos used to dump onto my computer under Users/conniecassinetto/Pictures/My Lightroom Photos/2014 because this is where I had instructed the software program to put them. I can change this in the top, right text button or arrow button each time if I chose to. The key to success is to check and re-check the right panel that has the File Renaming, Apply During Import, and Destination sub-panels each time you import. Simply adding photos leaves the photos at their same location. This section determines how the file will be imported. What you choose depends on the system you have set up and each options does something a little different. Some people like to import photos directly onto their hard drive on the folder where they store photos without linking them up to LR first, then they link them to LR as a second action. I do not know why people do this, as it is easier and quicker to do it all at once and LR is set up to handle most any need; in this case you would click on Add. Note that as you click each choice, the choices on the right panel change. "Copy as DNG" and "Copy," and "Move" remain the same, but "Add" leaves you fewer choices as the program believes you have already made your choices when you copied them to your hard drive. This panel contains four sections: "File Handling," "File Renaming," "Apply During Import," and "Destination." At the bottom of the panel you will see an icon bar for any external drives you have connected to the computer. File Handling: In this section, you can chose Build Previews, which dictates the type of preview you see and can affect loading time. Using standard preview the display preview is rendered as LR renders it, which is not the case with Minimal preview: it displays an image that is rendered by the camera so if you are viewing a RAW file the colors will not render correctly. Build Smart Previews, which allows you to work on files if the external drive you keep them on is disconnected for some reason; "Don't Import Suspected Duplicates," which is something I normally keep checked just to ensure that I don't import something for a second time; and, "Make a Second Copy To," which tells the program to make a back up of the original in some place you have designated. Each of these options, again, are personal decisions based on your workflow and computer storage capacity and workflow. Minimal will render LR previews as you use the file, which may take additional time: Standard previews will take up a lot of storage space and this may not work for some individuals with limited computer storage space. There are always pros and cons with every choice so try using both and see what works best for you. File Renaming: In this section, you can choose "Rename Files" and then choose a specific option on how to rename the files. There are many ways to rename a file. One of the easy ways is to click on Template> "Rename File," >"Shoot Name-Sequence." Then click on the box called "Shoot Name," and write in the specific shoot name, maybe a location. Check the box below that one to ensure that the number is the correct one that you want to shoot with, this is important if you are going to use multiple cards since you will then use a start number that is one above the last number of photos imported. You can also change the text extension on the file type if you choose to, "upper case," "lower case," or "leave as-is." Apply During Import: In this section you can change metadata, import develop settings, and add keywords. Metadata is set by you in this section or in another section of the program and not something the average person will need to know right off. Develop settings would allow you to have the program perform a specific action on the photo as it is imported, for example, putting a tone curve on, or turning into black and white, or auto processing the photos: the list is endless as there are hundreds of presets for this that you can download or buy as well as make on your own. Keywords are nice to add at this point if all of the photos are similar, for example, all landscapes, or trees, or people. You can also add keywords easily later on after importing. Use a comma between words for multiple keywords. Into Subfolder creates a file where you want it. Destination: This section is one of the hardest for many people to manage and where they get into trouble and "lose photos." What you see in this panel depends on what you have set up in your Pictures folder on your computer hard drive or external hard drive and should mirror your photo hierarchy once you have located it on your computer or hard drive within the panel. I keep every photo I've taken in one folder called My Lightroom Photos. All of my folders after that are sub-folders of this folder. So, my system would look like this: Macintosh HD>users>connie cassinetto>Pictures>My Lightroom Photos>2014 (for this past year). Each year I add a new year folder, so now I would have a 2015 folder within that structure. Within each sub-folder I have a folder that holds all of my photos for that year, usually named by location so the whole string would look like this: Macintosh HD>users>connie cassinetto>Pictures>My Lightroom Photos>2014>1-Winter & Spring Sierra Nevada. The number at the beginning of the file name is something I decided to add since it keeps my folders numbered in order; the program lists them alphabetically so I devised this system of using a 1 starting in January and going through the numbers to 12 for December and now my folders are in the order of the month they are shot. You can create your folders for this section in a variety of ways. One is to click the "Into Subfolder" box which brings up a box where you can name the sub-folder whatever you want to. Then click in the box below called "Organize" and choose "Into one folder." If you use this system, be sure that you are clicked on the actual folder you want your photos to reside in, in the filing system below where it names your drive, as the sub-folder will go into the folder that is highlighted. For example, if I wanted to add a sub-folder to my 2015 folder I would have to have that folder highlighted. You need to stop and read this box every time you import or your photos will go into some folder that you did not intend them to go in and thus the "lost photos" disaster. You can also highlight the folder you want to use and then right-click>Create New Folder; a window opens up and then you need to navigate to the folder of your choice and at the bottom left click New Folder. Name the folder and click Create. This folder will show up in the Destination panel. A third way would be to create the folder ahead of time in the Library Module, which I will not go into at this point. After you have made your choices, click "Import" and the import process begins. Remember, LR is not importing your photos into a database within its software, it is simply building a link to the files you are moving from your camera or camera card to your computer drive or external drive as designated by you. The only database that LR creates is a database file that contains any changes you make in the Develop module.